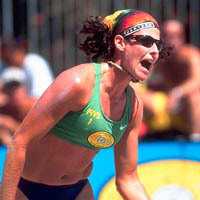 Reno and Holly McPeak placed fifth at the 1996 Atlanta Olympic Games. Reno graduated from Stanford in 1988 and spent 1989 attending Middle East Technical University in Ankara, Turkey. She lettered four years in volleyball at Stanford where she earned All-American honors and was selected as the school's top Female Athlete. Reno was also an Academic All-American. Her hobbies are woodworking, painting, scuba diving and guitar playing. Reno has worked on a doctorate in animal biology at the University of Colorado in Boulder.